While searching for a cheesy dip to make for tonight’s festivities, I came across an old favorite of mine that my mom had made when I was younger. It is one I have fallen to many times over the years because it is so quick and easy, and always goes over well whenever I make it for gatherings. This recipe is both perfectly cheesy with just a little hint of spiciness. I love how it has that ‘comfort food’ factor due to its warmth and heartiness. On these colder days, who doesn’t love that? 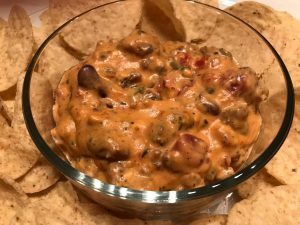 When I saw this cheesy dip recipe again, I was reminded of how much I’ve always loved it and knew that once again, it was going to be my go-to dip. 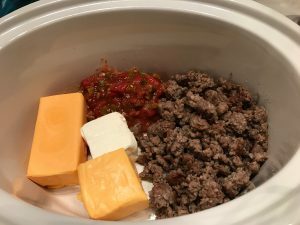 Because my day is going to be fairly busy, hubby and I prepared this late last night and let it go in the crockpot on a warm setting overnight. It didn’t get stirred until this morning and melted together as it was supposed to. Because it makes a decent amount, I cut the recipe in half when making it and only used the sausage. I made a couple of other changes, which will be noted below. If you’re looking for a quick, last-minute cheesy dip recipe, this one is a winner! There is so much that can be done to customize it to one’s tastes. I hope you enjoy it as much as I always have. In a large skillet over medium heat, brown the ground beef and ground sausage until no longer pink. Remove with a slotted spoon and place on a paper towel-lined plate to drain. If you like what you see, please click the ‘Facebook’ button below to share! Previous post2016 is Coming to an End, But 2017 Will Be Great!